Give your home the Professional Care and 5 Star Rated Cleaning Service it deserves by hiring our team of professional cleaners to ensure that your windows maintain the spotless clarity they were made to provide. Our team is committed to providing the highest quality of window cleaning service in the industry, and we have the tools and experience to meet that expectation. We wash all sizes and types of windows, inside and out. We can also clean skylights, chandeliers, and mirrors as well. Call us today and we will be happy to provide you with a custom quote for all of the windows and glass surfaces in your home. Are you in need of hiring a professional window cleaning company? Look no further. Here at Columbia Brothers Power Washing we supply all the equipment and skills necessary to tackle just about every type of job you have for us, no matter how big or small it may be. Cleaning your own windows can be a big task, especially if you have a home with a lot of windows or glass that is hard to reach. Allow us to assist you and check window cleaning of your to-do list. We’re committed to providing consistently reliable service in a timely and professional manner. Our Window Cleaners are professionally trained, highly skilled and courteous. We love cleaning windows so you don’t have to! Give us a call or fill out a contact form to set up an estimate! Get the results your home deserves with our premier quality window cleaning and pressure washing services. We offer all our services at affordable and competitive rates. Our qualified team of professionals bring their experience and trained knowledge with them on every job. But what really sets our services apart from the rest of the industry is our attention to detail and receptiveness to the unique needs of each client. We are dedicated to serving our customers. 100% Satisfaction Guaranteed. We understand how important it is to feel confident and worry free when it comes to choosing a window cleaning and pressure washing contractor, especially when it comes to cleaning the exterior of your commercial location. We are here to offer our professional services to you and set your mind at ease. Our dedicated staff invests the time and energy necessary to be well prepared for any unique requests or special concerns our clients may have. Give us a call if you have any questions and to receive a free quote. Regularly-scheduled window cleaning services are a great way to keep your home looking like it did the day you moved in. The best way to manage your home’s cleaning needs is to schedule a routine cleaning with a company you can count on. For most homes, we recommend window cleaning service twice per year. However, if you live in a high-traffic area, a window cleaning every three months may be required. Another home maintenance service we are proud to offer is concrete driveway cleaning– where we will wash and remove stains and dirt to renew curb appeal! Ask about our routine service options and special pricing! Professional window cleaning is something that requires the right tools, skills and experience. Our team has the knowledge to use the right equipment and the industries best techniques to clean your windows completely. Some window cleaning companies might not take the time or care to fully clean a window, leaving behind excess water. 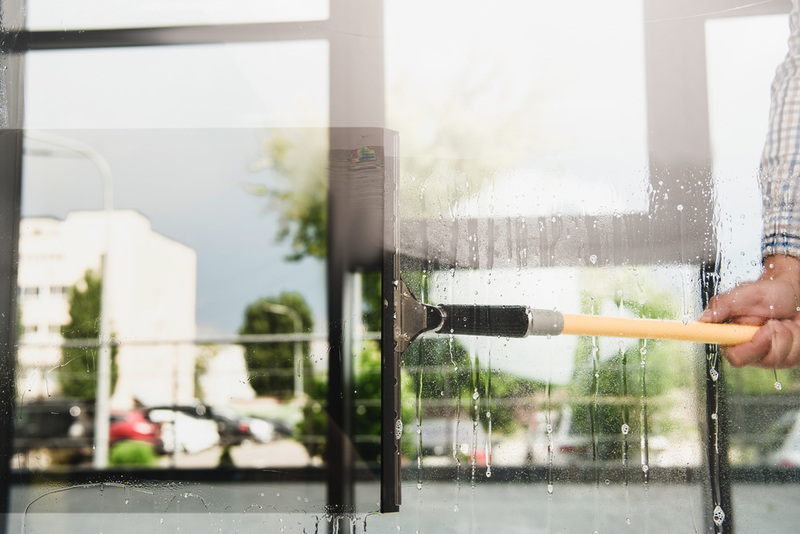 We make sure to remove all of the dirt and dust from your windows, scrub the window, and squeegee the excess water, and then wipe all edges of the glass to remove any water that remains. This results in a fully-cleaned window without drips and streaks, giving your home the polished look you want. We guarantee we will only use the safest cleaning methods available and latest techniques in the industry. Contact us to schedule your next window cleaning appointment today. Best window cleaning company around! The employees are very friendly and do a great job. Each employee is meticulous and makes sure every window is spot free. Our windows have never looked better! They are so clean and have made our home look so beautiful! These guys do great work! They cleaned up windows, sills and screens for a great price. I will be calling again to get my windows cleaned! This company will make your windows sparkle from the streets!! We have been customers for years and enjoy getting our windows cleaned twice a year. They are always punctual and ready to work! Just got our windows cleaned by columbia brothers power washing and they look great! They were professional, courteous, and hard working. They paid attention to every detail and their goal was to ensure we were happy with the results. We are 100% Satisfied!! The friendly team arrived early and left on time! Very happy with the end results! I highly recommend these guys! Very fast & efficient window cleaners. Our windows are officially spot and streak free!! 5 star company!! !